Billy Bonds gave 21 years of his life to West Ham, between 1967 and 1988, playing 799 games for the London club. He is the only player to captain them to two FA Cup victories, in 1975 and 1980. Now the club is awarding him with the name of east stand at London Stadium. The naming will be unveiled on March 2, before the game against Newcastle. He joins fellow club greats Bobby Moore and Sir Trevor Brooking in being recognised in this way. “It's a great honour and means so much to me and my family,” Bonds said. “To think that I am only the third West Ham player to receive this honour after Bobby Moore and Trevor Brooking – you can't get better than that,” he added. 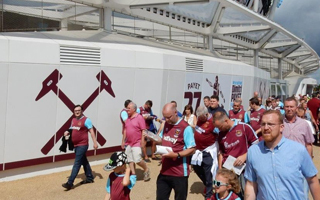 Two stands at the club's former home, the Boleyn Ground, were named after Moore and Brooking, before being transferred over to London Stadium, which West Ham rent from owners the London Legacy Development Corporation. Like those stands, the naming only applies to match-days at the stadium which is also used to host other events.